Free rice play and help is very interesting. It’s a great timepass and fun game to play, isn’t it? Thanks Vineela. The game is a time pass and I made 1420 points.Im going to play again and donate as much rice as I can. Free rice is such a cool idea. Love it! Thanks for sharing this idea with all the food lovers, Indira. This is a lovely write up on Saffron, thank you Anjali. Always learning here! And I too am enamoured of that rice site! Thanks for the nice writeup on the lovely Saffron. Apart from being a good ingredient in indian food it has excellent medicinal properties. A Decoction is made out of saffron and Somb which when given to a pregnant lady after her proper labour pains have started, it quickens the delivery tremendously. For both my kids I have expereinced this and my labour hours are less than 2. I really adore this spice like anything. Lovely article on saffron…and thanks for the link on ric grains..I came to 2000 points..tired to go further..too much taxing for the brain after that I felt…:D..thanks Indira for taking pains to get us participate in such useful things.. Thanks for yet another of the spice-stories. I have never seen a saffron flower before..Thats something which I believe till now I have missed so far!!! I will ahve to tuck all this info! Always enlightening to visit your blog. Ma’m, U have an awesome knowledge abt cooking.Hats off to you.I have been a silent reader of your blog since long.Please accept my best regards.have a great weekend! My paternal grandmother was an expert midwife and she has assisted the birth of ALL her grandkids.I remember she once told me that saffron milk was one of her secrets to quicken the delivery. Of course, like you mentioned, saffron is only used when proper labour pains have started and never before that. Fantastic and well done information about Saffron. Do you have any recipes or ideas to work with saffron in bread or baking, cakes and so on? may I need one for my wife. but sorry, the most of her sites are in German, not in English. this game is so time pass & i got 1250 points. 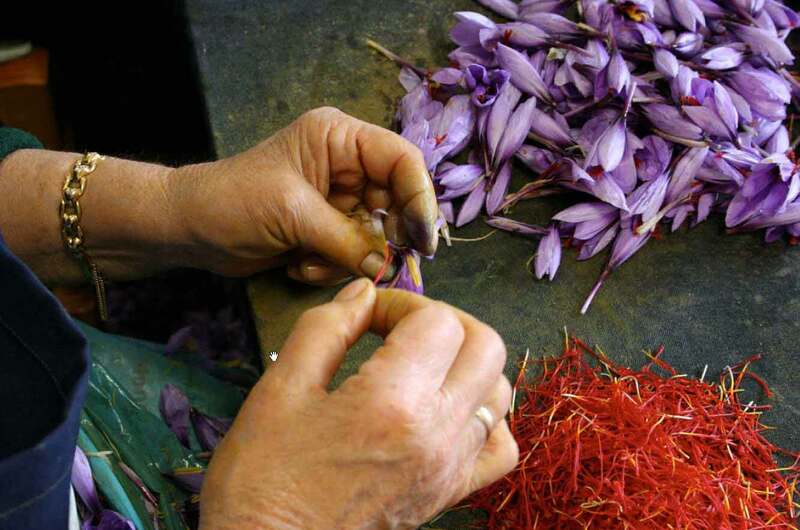 Lovely post on Saffron. Good luck with growing it. I look forward to some photos of it growing? I have a book on muffin & quick breads, by Linda Fraser. It has a recipe for Saffron Focaccia. And I found a similar one at this link too.